Good morning friends, and welcome to a very lovely Saturday. Or, as it’s known in some parts of the world, Christmas Eve. Just because it’s the holidays doesn’t mean we put our love for all-things-car on hold, so we’ll be going all weekend. Please join us. Today we’ll be re-running a few of our favorite stories from the past few years, as now’s the best time to sit down, relax, and finally read that epic masterwork you’ve always wanted to get to but never got the chance. It is as if a minute now is fuller than a minute then. More room in your headspace. Your eyes are opened, the edges of the world aren’t so far out into your periphery. And tomorrow, we return to our annual tradition of Group C-smas, where we obsess and drool over our favorite era of racing, that of Group C and GT1-style endurance challenges. And if that’s not enough, there’s always a dancing Tesla. Raphael Orlove and I will be your two guides for the next two days, and if you’re sick of your friends, your family, or just don’t celebrate, we’ll be here. With the cars. The blogs and the cars. Cars. Christmas. 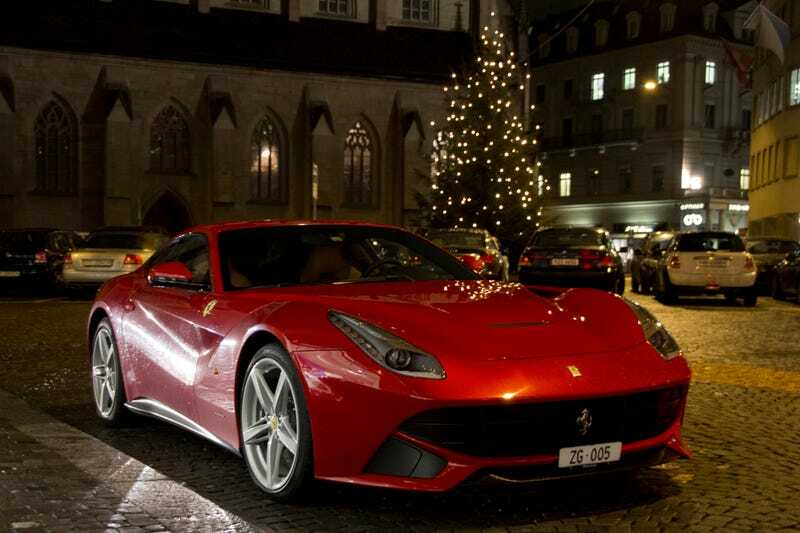 Christmas cars. Car christmas. Chanukah. Gift of cars. Kwanzaa. Holiday cars. That’s a nice picture of a Ferrari.